If you think so, keep reading now to see how you can be one of a select few to join me as I get into the best shape of my life with fitness coach Thomas Phillips! Are you a health conscious individual who believes that smart eating and exercise are the keys that unlock the doors to health and longevity? Do you see the value in having an expert help you achieve your goals in life instead of wasting time and money trying to figure things out for yourself? Well, if you’ve answered yes to these questions we are indeed likeminded people. You see about 5 years ago I decided to seek out a personal trainer to help me achieve my fitness goals. I am a big believer in coaches. I have had baseball coaches, business coaches and I found an awesome fitness coach in Thomas Philips. Although I have always been involved in fitness and exercise, looking back now I’m amazed at what I‘ve learned over the years working with Thomas and his winning staff. I can honestly say I am in the best shape of my life! Just from reading this list of achievements, you can see Thomas’s someone who not only “talks the talk” but definitely “walks the walk!” In fact, he has become a leader in his field and is praised by his clients and many of the top names in the fitness industry. Last Christmas my wife gave me a gift of 10 personal training sessions with Thomas Phillips. It has turned out to be the equivalent of a new bike to a ten year old. During the last year Thomas has taught me exercises to strengthen my body and most especially my back, and I can now do things that I was not able to do for the last twenty years. Thomas pinpointed the areas that I needed to improve and set-up routines that would help me achieve fantastic results. I have been training on a weekly basis with Thomas for the last year and will continue to for the coming year and beyond. I started working with Thomas four months after having my second child and returning to my full time career. I was always physically active but after gaining 50 pounds with each pregnancy, suffering knee and hip pain and managing a challenging career, I was in need of some help. I was shocked by Thomas's willingness to train me at very early and late hours. His dedication to his clients and their goals is unmatched. His personality and individual strength are an inspiration and certainly got me to 5:45 am sessions! In only five months, I was pre-pregnancy weight and leaner, stronger and healthier with the ability to take on my two babies and have all the energy I needed to succeed in my work. I've never spent a cent so worthwhile. Thomas is priceless! My husband, my kids and I thank him! Driving force, source of power, motivating and enthusiasm. These are some of the qualities Thomas exudes. More importantly these are the qualities that I exude having trained with Thomas the past 3 years. Thomas has shaped my body into muscle I could never imagine existed. Training with kettlebells, pushing sleds and cardio has been the standard by which I start my day. I have seen many videos and witnessed many trainers who don't expect the high standards that Thomas exemplifies. NIX THE BIGGEST LOSER, THOMAS PHILLIPS IS THE REAL DEAL. On August 29th, Thomas is entering his second natural bodybuilding show right here in New Jersey. With the urging of one of his clients they decided to turn this process into something BIG! That’s right, if selected, you will have the opportunity to work along with Thomas as he shares with you all his secrets for getting into head-turning, competition shape! I made the decision to join because I know I will be in the best shape of my life for my 40th birthday on July 12th ; as a likeminded thinker, I’m now hoping you will follow my lead. So What Kind of Program Is This Going To Be Anyway? people. (That’s right, what you just read is 100% correct!) Not to mention you will be eating healthier than you ever ate before. This is not some fad diet or “get thin quick” gimmick you see on the internet. As a doctor I would never endorse a program like that let alone be part of it. (So if this is what you’re looking for, you should stop reading right now and Google something else as Thomas’s program is definitely not for you!). return what you will learn and take away will be something you can use forever! This Program Will Begin on June 8th. It’s a 12 Week Plan Divided Into 3 Phases. This will be a living documentary on the methodology that Thomas uses on himself, his wife (competitive figure athlete) and his nutrition clients time and time again with enormous success. The documentary will be filmed and marketed later. Be a part of something INCREDIBLE as Thomas takes you step by step and day by day through what won him $50,000 and the most prestigious body transformation competition in the world! Even fitness experts and doctors have experienced great results! I have been teaching the martial arts for over 20 years and have trained with many people. It is not often that you meet a trainer who not only has a passion for fitness but a passion for people. Thomas is just that person. He walks his talk and is a living example of his program and training philosophy. If you are serious about achieving results, whether you are an athlete looking to improve your game or if you are just looking to improve your level of fitness Thomas has both the knowledge and desire to get you there. I’ve trained at Fit-For-Life for almost two years. The level of attention I receive is unparalleled, that’s why I’ve trained with them so consistently, I never miss a session. At 46, I understand the work that’s involved just to stay in shape. With the Fit for Life system, I’ve exceeded my expectations and reestablish new goals on a regular basis. The trainers treat me like a friend, I never feel like a “client.” The staff is unbelievably knowledgeable, caring and motivating. I never feel inadequate or embarrassed; on the contrary I always leave feeling accomplished. They are honest, caring and hard working people. I initially came to Fit for Life to improve my physical fitness, what I received was a life transformation. My training sessions are on Wednesday evenings, and I can honestly say I look forward to it during the day. Of course the workout is always very challenging, but the consistent euphoric feeling I get afterward is almost addictive! No matter how stressed I may be during the day, I always feel improved afterwards. Perhaps the most important point to make would be that as a sports medicine physician, I am aware of the harm that can be caused by inappropriate exercise. Thomas Phillips and his staff have extraordinary knowledge of appropriate safe exercise while also providing an extremely challenging workout. I feel safe sending my patients to him, which says a lot! As a former strength, conditioning, and boxing coach at the Bergen County P.A.L. and a self-employed chiropractor of 25 years, I have had the/ opportunity of attending a multitute of seminars and hands-on training programs with some of the top educators in the country, but few have impressed me as you have. Your combination of knowledge, teaching skills, and confidence will unquestionably lead you to the top of your profession. I look forward to training with you again. So Who Is Thomas Phillips Anyway and How Can He Prove Time and Time Again That Nobody Has a VALID Excuse For Not Being Fit-for-Life? Thomas Phillips is a full time special education teacher, husband, father of 2 and does 53 private training appointment (each one 30 or 45 minutes) per week (including several group classes). His services have been ranked 10 out of 10 in over 50 client reviews and his knowledge in the field has been praised by some of the top fitness names in the industry. 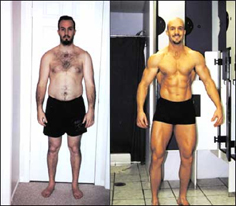 Below is Thomas’ 2002 Body for Life before and after photos that earned him $50,000 and the most prestigious body transformation title in the world. Below is Thomas Phillips today… competitive natural body builder, nationally ranked raw powerlifter and owner of Fit for Life personal training studio in Marlboro, NJ for the past 6 years. On August 29th I am competing again in a natural body building competition, this time in Burlington, NJ. I will be continuing my dieting through Monday June 8th (giving me about 12 weeks until the competition). I learned a lot during my body for life transformation 7 years ago and have continued to learn much since then; including the 12 weeks leading into my last competition. I continue to adapt and learn from my mistakes. This time I plan on capitalizing on ALL these experiences and share them with all of you first hand in a documentary that will change your life as it has changed mine and the countless others I have helped through the years. The program will be done in 3 phases, each phase lasting 4 weeks. Despite what you may believe about a body builder’s diet, what I do is anything but a “starvation diet”. In fact, I eat more food more often than most people. I also incorporate well-timed “cheat meals” for the first 2 phases. The catch is that I am meticulous in preparation, food timing, quality of food choices and macro-nutrient ratios. The purpose of this website is to invite 50 men and 50 women to take this journey with me as I film a documentary to later be marketed to thousands who will ENVY your success! Be aware that this is a demanding journey, but the hardest part is simply getting started by developing better habits. With all of us in it together you have an incredible support system since we will all be rooting for each other to succeed. If you can get your spouse to do this with you even better because it is very hard to be in a house where you are not all on the same page. If you think you have what it takes fill out the form below ASAP and I will send you an e-mail to determine your eligibility. Understand though, once I fill the remaining 43 spots that’s it! So, if you take what you want for yourself seriously it's time to take action...don’t miss out on this once in a life time opportunity! So Why Just Diet, When You Can Be a Part of Something HUGE? See If You Qualify To Be Part of An Exclusive Documentary That Will DRAMATICALLY Change Your Health, Physique and The Way You Live Forever . . .
A 1 hour seminar at the beginning of each phase where we will all get together to weigh-in, write down our goals, monitor progress and take progress pictures (optional but encouraged), as well as discuss nutrition in general. I will explain how and why I do what I do and answer any and all questions. I will blog my food journals including the amount of food consumed and time I ate it on each day so you have an exact guide to follow. Adjustments will be made for women, and individual adjustments for everyone will be made after the first week. More will be said about this during the phase 1 meeting. Shopping lists with exact brand labels, cost, etc so there is no ambiguity about which products to purchase. I always shop at Wegman’s. How to best prepare food and when so that you do not fail because when it comes to breaking bad nutritional habits failing to prepare is preparing to fail. The supplements I use, when I take them and why. Continuous support via blog on a daily basis to answer commonly asked questions; I will also check each of your menus on a daily basis as you send them in and comment where necessary. As we move from phase 1 to phase 2 and phase 2 to 3 etc we will meet to take pictures again and weigh-in to monitor progress… this will be done every 4 weeks. At the end of 12 weeks I will have a professional photographer come in to take pictures of everyone looking their absolute best. This is your chance to look your ABSOLUTE BEST this summer . . . . . . understand that EVERYONE wants to look great, but not everyone is willing to do the work it takes; so let’s make this journey together (as a team) and support each other through the process. Are you ready for a program that will provide you with the knowledge and tools to create a real change in the way you look and feel…for life? Step 1. Fill out the form below along with your fitness goals. Step 2. Check your email as Thomas will be contacting you with the details of your acceptance. What: During this 1 hour seminar Thomas will share with you some of his secrets on how to turn your body into a fat burning machine! From meal prep ideas to the best types of exercises, you’ll learn all you’ll NEED to know to successfully achieve your fitness goals. Who: Limited to 100 qualified participants. Okay, that’s it for now. One again, thank you for your time, I look forward to seeing you on June 9th as we begin our Fit-for-Life journey together. P.S. At this point, if you aren’t 100% convinced that this elite training program is right for you, pick up the phone right now and call 1-800 892-5043 for a 24 hour recorded message from Thomas himself. However, if you truly do think like me and are ready to get into the shape of your life, then go ahead now and fill in the registration form below as there are only 43 slots left! See you on June 9th. Powered by: Physicians Marketing Solutions, Inc.